Betfred are offering extra winnings in the form of double odds if your winning first goalscorer goes on to score a 2nd goal. If he goes on to score a 3rd then they'll treble the odds! Maximum cash returns £6,000. Selected matches only. This can be a very lucrative offer if you can find close matches, and it's not uncommon for people to make in excess of £1000+ when it lands. Selected matches can be found on the promotional page here. Your player must score the first goal, and then score again for the offer to land. If he scores a hat trick but doesn't score the first goal, you won't qualify. Because of this only bets on First Goalscorer market count. A player to score first and then going on and scoring 2 more isn't very common, but when this offer lands it can be extremely profitable. Even scoring just 2 goals can be worth a lot of money, which is why this offer is favoured by Matched Bettors with a Hustler mentality! Open Betfred and your exchange and find a player who's back and lay odds are close on the First Goalscorer market. 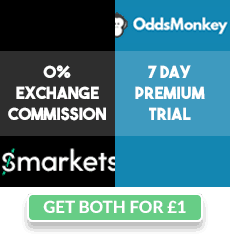 You can use Oddsmonkey's Oddsmatcher to filter the First Goalscorer market only. Try to pick players in games where their team is favourite so there's more chance of scoring. When deciding how much to stake you should bear in mind £6000 is the maximum total payout, and you want no more than around £5-£10 loss per £100 you bet. You can take bigger losses in games with big favourites (For example Lionel Messi playing for Barcelona against a rubbish team). If your player scores first and scores a 2nd goal at any point in the match, you'll get paid out double odds on your original bet and so will have a tidy profit. 2 goals will trigger a lot more often than 3 goals and is still very profitable. If your player scores the first goal, a second at any time, and a third goal at any time then Betfred will pay you out triple odds giving you a massive profit. Hat Trick Heaven doesn't trigger very often as not many players score them. It's best to keep an eye on top goalscorers and seeing who's on form at http://www.bbc.co.uk/sport/football/premier-league/top-scorers. Bonus credited as real cash within 24 hours of bet being settled. As always try to find a close match between the back and lay odds. Football teams announce their team sheets 1 hour before a game on twitter - get ready for movements in the market on Betfair and try to snap up some good matches. Try to bet on every Barcelona and Real Madrid game whenever they have DD/HH on as it triggers more.